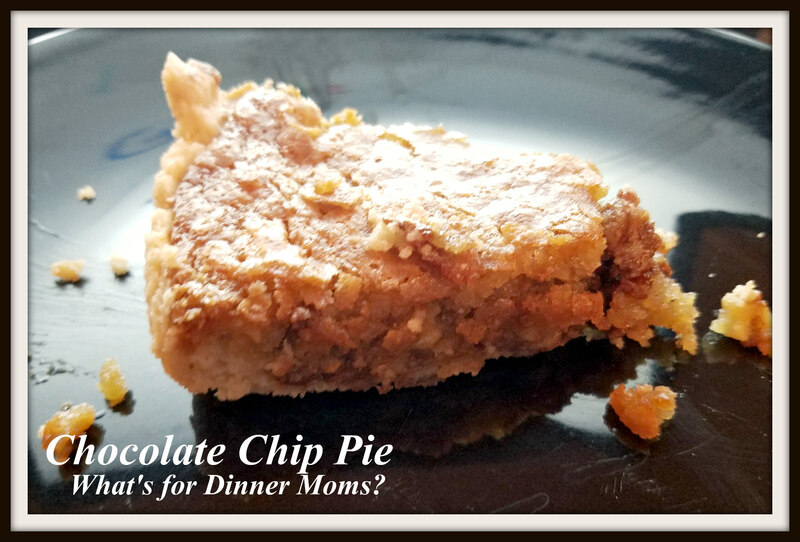 Christmas Treats Week 4: Chocolate Chip Pie – What's for Dinner Moms? You may have noticed I changed my weekly Christmas Cookie day to Christmas Treats. Since I really wasn’t making many cookies right now I decided Christmas Treats was a much better name. We are planning on doing lots of baking in the next week or so. As I watched the weather forecast tonight and the highs are supposed to be well below zero (without wind chills) and the lows are supposed to be close to 20 to 25 degrees below zero (without wind chills) and I think my little family will be spending lots of time inside reading, playing games, and baking. I so very much love those days. We are heading into the end of the month so that means we are using up some of the bits and pieces in our pantry, refrigerator, and freezer. We have lots of baking ingredients (as usual) but want to use up some of the nuts and chocolate chips that were partial bags the kids had opened. This was a delicious way to do that. 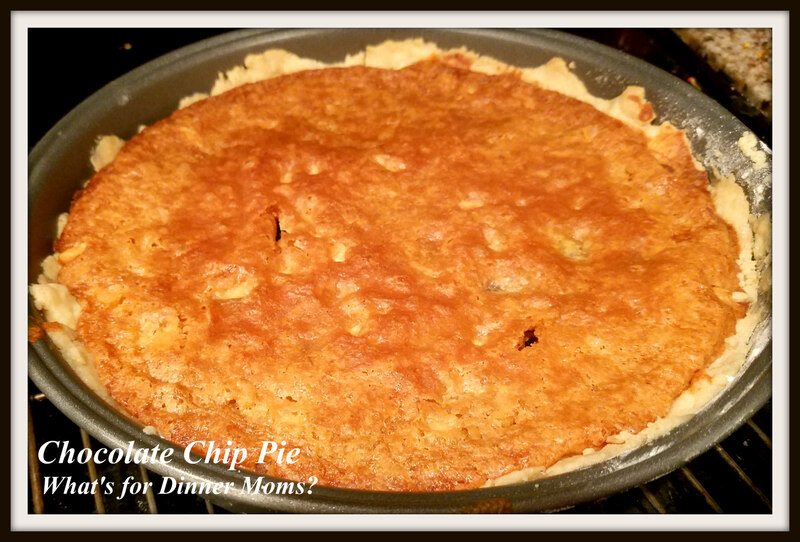 The pie crust wasn’t beautiful but the pie sure tasted good! The kids asked that we make this again real soon. It was deliciously sweet and the walnuts really added a nice texture. Serve this with a nice scoop of ice cream and a drizzle of hot fudge sauce or chocolate syrup to make this even more tasty! A deliciously sweet pie to serve as a tasty dessert. Preheat the oven to 325 degrees. 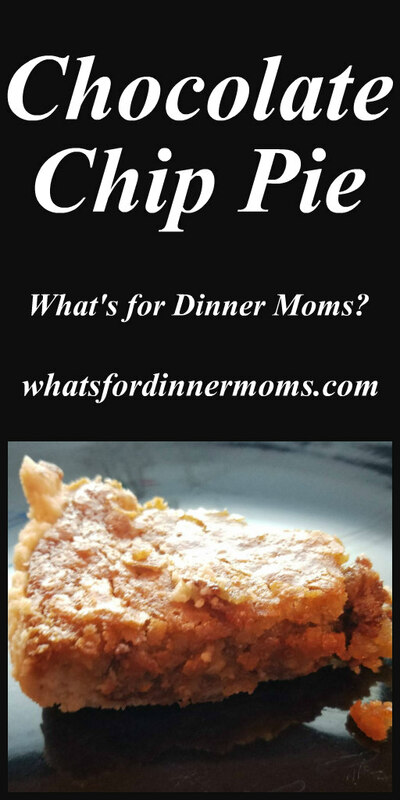 Line a deep dish pie plate (or round cake pan) with the unbaked pie crust, crimping the edges. Set aside. In a large bowl, beat the eggs on high-speed until light-colored. Add the flour and sugars to the bowl and mix again until well combined. Add the softened butter to the bowl and mix again until everything is well mixed. Stir in chocolate chips and walnuts and mix until the chocolate and nuts are evenly mixed throughout the batter. Pour the batter into the prepared pie crust. Sprinkle flour on the surface you will be rolling on before rolling out the dough. Roll the dough about 1/2 an inch larger than your pie pan. Turn the edge under and use thumbs “flute” the edges of the dough. This is an interesting recipe, Marci.